User-to-user chat allows you to never miss a beat with your colleagues while keeping track of your entire messaging history in the process. One-on-one and group interactions help keep everyone on the same page no matter how complicated things get. Make unnecessary meetings and phone calls relics of the past by swiftly communicating with your circle from the Mortgage Manager app. Mortgage Manager’s user-to-user chat functionality makes communicating with your team in real time a breeze. Whether you want to relay timely information to your entire group at once or simply ask a question to a single colleague, user-to-user chat helps you get the answers you need, quickly and effectively without ever having to leave the app. — it all happens right within the software. Never let sensitive information flow into unsecure third-party applications or personal conversations again by ensuring it never leaves your Mortgage CRM infrastructure. Mortgage Manager makes discussing numbers, addresses and additional client details safe and secure, thanks to advanced data encryption and Cimmaron’s Cloud Crypt technology. Whether you need to revisit a conversation from months ago or simply confirm a specific detail that may have slipped your mind, Mortgage Manager keeps a complete log of all of your internal communications from the moment you begin using the chat feature. Say goodbye to black holes and redundant messages.Your phone’s texting app is for communicating with friends and family, not clients and referral partners. 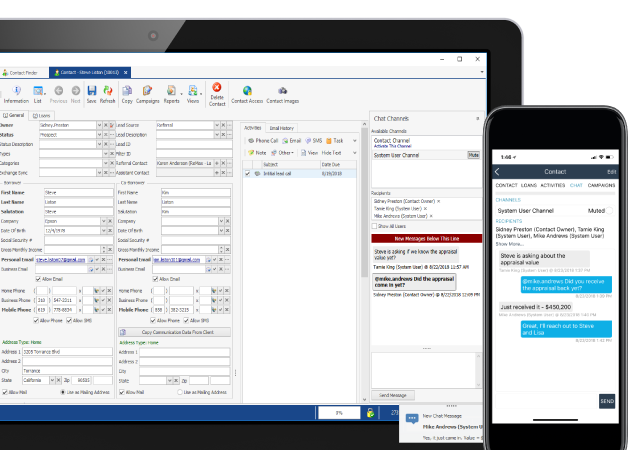 Mortgage Manager allows you to separate your business and personal conversations while keeping track of each and every client interaction in a single place. Analyze messaging history for trends, important touchpoints and open/response rates—how deep you go is entirely up to you.